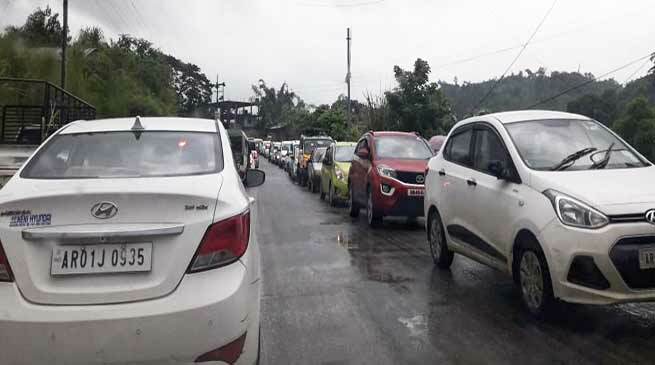 People travelling on the National Highway particularly on the stretch between twin capital city Itanagar and Naharlagun , have been experiencing unprecedented traffic jams. On the onset of monsoon and due to under construction of the four lane road in twin capital city the commuters have to face lots of trouble. Since due to a small landslide and huge deposition of mud today between Itanagar-Naharlagun the commuter preferred better to take the bypass road Papu nallah-Jully-Itanagar and every one followed the same and a heavy and unprecedented traffic jam was seen even on Papu Nallah-Jully-Ganga-Chimpu road. The road from Chimpu-Itanagar was also full of vehicle crawling like snail. One commuters said he is experiencing the first traffic jam of the year, he take around two and half hour to reach A Sector Naharlagun from Ganga. One commuters said that though we have to face such traffic jam everyday and on most occasion it is manmade due to parking of vehicle in no parking zone, overtaking of trekker, and even sometime by VIPs vehicle. One lady driver said that due to traffic violation by two wheeler moving in between two vehicles on road there have been jam and everybody have to face such jam everyday. She urge upon the law enforcing agency to strictly enforced the traffic rule and check illegal parking in the township busy area.